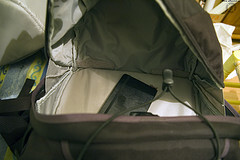 Rich Christian, Poor Christian: Who or What Is In Your Backpack? I'm a thinker. That's what I do. This is how God wired me. My mind is constantly churning over something I recently read in a book or online, a TV show or movie I've recently watched, or what my next great blog post is going to be about. 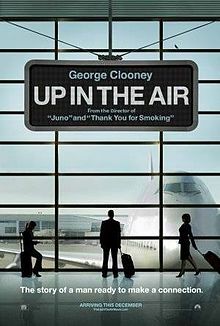 A few days ago, I watched the movie Up In The Air. This was a result of either a recommendation I read online or someone actually recommending the movie to me. Either way, I had placed the movie into my Netflix DVD queue and received it in the mail a couple of weeks ago. The short version of the plot to the movie is this: Ryan Bingham, played by George Clooney, makes his living by traveling to various workplaces around the country and firing employees when the companies are unwilling to do it themselves. As a side job, Ryan is also a motivational speaker, using the analogy "What's In Your Backpack?" to praise the advantages of a life free of burdensome relationships with people as well as things. Ryan thoroughly enjoys his constant travels. He would rather be in an airport terminal or airplane than to be stuck at home in Omaha, Nebraska. Through his travels, though, he begins to build relationships with two women. The first woman is also a frequent flyer who he meets during his travels and with whom he has a casual relationship. The second woman is a fellow co-worker who ends up flying around with him to see how the business actually works. As a result of his experiences with these two woman and his job, Ryan starts to view life and relationships in a different light. He begins to re-think his entire philosophy of the empty backpack. Perhaps life is better when you have a co-pilot, when you have someone to share your life and experiences with? At the end of the moving, we see Ryan desperately reaching out to his "plus one" to share his life with her, but things don't end up as he planned. He ends up alone, reaching his goals, but unsatisfied with the results. In many ways, I can relate a lot to this movie. "I've been there, done that, and got the t-shirt" now on two separate occasions in my life. First, when I left home for college in my late teens, I was single and free as a bird. I had a "plus one," but then that relationship ended up not working out for me. At that point, I kind of adopted the Ryan Bingham philosophy and just travelled through life as lightly as possible to get my college years completed and discover God's design for my life. Around the time I was called into ministry, I met my now ex-wife, and we began a journey together for almost 11 years. We bought two homes together, started a family, and lived out what I thought was your typical American, Christian, family life. My second experience with loneliness ended up when my now ex-wife firmly decided she didn't want to be married anymore. My backpack was suddenly turned upside down and partially emptied, and I was back to a state of semi-loneliness. I say semi-loneliness because now I had two young daughters in my backpack so-to-speak that I had to care for, at least half the time. But kids and spouses are two separate relationships that meet different needs. My "plus one" was gone once again, and I found myself feeling all those crappy, all alone feelings from my college years. I started focusing on what I had left in my backpack and how God wanted me to continue on in my journey. Here's a scary thought. Traveling alone without a co-pilot may be your life's calling. Having an almost empty backpack may be His design for your life. I don't believe the majority of people are designed to live this way, but some end up on this path because we live in a fallen world. When this does take place, we need to fill our backpacks with close friends and family. We need to fill our backpacks with God's purpose for our lives. Jesus replied, “Moses permitted you to divorce your wives because your hearts were hard. But it was not this way from the beginning. I tell you that anyone who divorces his wife, except for sexual immorality, and marries another woman commits adultery.” The disciples said to him, “If this is the situation between a husband and wife, it is better not to marry.” Jesus replied, “Not everyone can accept this word, but only those to whom it has been given. For there are eunuchs who were born that way, and there are eunuchs who have been made eunuchs by others—and there are those who choose to live like eunuchs for the sake of the kingdom of heaven. The one who can accept this should accept it” (Matthew 19:8-12). Just then a man came up to Jesus and asked, “Teacher, what good thing must I do to get eternal life?” “Why do you ask me about what is good?” Jesus replied. “There is only One who is good. If you want to enter life, keep the commandments.” “Which ones?” he inquired. Jesus replied, “‘You shall not murder, you shall not commit adultery, you shall not steal, you shall not give false testimony, honor your father and mother,’ and ‘love your neighbor as yourself.’” “All these I have kept,” the young man said. “What do I still lack?” Jesus answered, “If you want to be perfect, go, sell your possessions and give to the poor, and you will have treasure in heaven. Then come, follow me.” When the young man heard this, he went away sad, because he had great wealth. Then Jesus said to his disciples, “Truly I tell you, it is hard for someone who is rich to enter the kingdom of heaven. Again I tell you, it is easier for a camel to go through the eye of a needle than for someone who is rich to enter the kingdom of God” (Matthew 19:16-24). So, Who Or What Is In Your Backpack? In Ryan Bingham's motivational talks, he asks his audiences, "Who or what is in your backpack?" How would you answer that question? Would you take on the same skewed, jaded view as Ryan? Are you trying to get your backpack unpacked as fast as possible of people and stuff? Are you trying to go it alone with as little baggage as possible. When it comes to people, we do need each other. If we do have a spouse, then we need to be sure that they truly are our "plus one" and that we are striving for "oneness" in our marriage. If we are single, though, by design or circumstances, then we need to fill that backpack with our friends, family, and Kingdom purpose for our life. When it comes to stuff, seek out the simple life. Stuff never made anyone happy long-term. Go "lean and mean" and use your resources for the Kingdom instead of trying to stuff your backpack full of a bunch of nice junk that isn't going to last.